Sign up to help restore and clean up the trails in Highland Hills Park! Please click HERE to watch the Fort Thomas Crosswalk Safety Video! FIT IN THE FORT KICKOFF/WEIGH IN: April 27th 10 a.m. to 2 p.m.
NKY SENIOR GAMES: May 13th- Register at 9 a.m.
SUMMER CONCERT SERIES IN TOWER PARK 7-9 p.m.
PUB CRAWL: July 3rd 6-11 p.m.
JULY 4TH CELEBRATION IN TOWER PARK: 3:00 p.m.—10:30 p.m. FIREWORKS AT 9:30 p.m. Colour of Rhythm will Headline! TOUCH A TRUCK: September 7th Tower Park: —11 a.m. to 2 p.m.
GREAT OUTDOOR WEEKEND: September 28-29 More info to come! TOWER PARK CAMP OUT: October 4th-5th More info to come! JACK-O-LANTERN WALK: October 25th Tower Park 6 to 9 p.m.
HOLIDAY WALK: December 1st 5:30 to 8 p.m. Tree Lighting at Inverness Park at 5:30 p.m. If you are interested in participating in the 4th of July parade this year, please fill out the form at the link and return to Melissa Beckett, 130 N. Ft. Thomas Avenue, Ft. Thomas, KY 41075 or drop at the city building, 130 N. Ft. Thomas Ave. M-F 8:00 a.m. to 4:30 p.m.
Sign Up for the City Wide Yard Sale! Please fill out the form below to be added to the map for the yard sale on May 18, 2019. Smart 911 Sign up now! Over 80% of calls made to 9-1-1 come from mobile phones. When you dial 9-1-1 from a mobile phone, the 9-1-1 call takers have very little information to help you – only your phone number and a very general sense of your location. This is a serious problem in an emergency when seconds count, particularly if you or your loved ones have medical conditions, or are unable to safely speak. Sign up for Smart 911 Now! We wanted to put out a friendly reminder that if you walk or jog before sunrise of after dark to please try to wear reflective clothing so that drivers can see you. We want to keep you safe! Need help with home heating costs? There will be a Public Meeting held on Wednesday, November 28th at 6:30 p.m. in the Council Chambers of the city building. Please Click Here for the plans. Please note that this is a large file at 17 MB. Please be aware of who you are talking to at all times. No matter where you drive – from rural roads to suburban streets and even highways around our cities – the threat of a collision with a deer is real. Deer collision accidents are on the rise, partially because the deer are being displaced from their natural habitat by urban sprawl but also because the deer population is growing. Deer collisions are most likely to occur during deer breeding season – from October through early January. Prime times to find deer near the roadside are around dawn and from dusk to late evening. Deer are pack animals. So if you see one, be assured that others are usually close by. Always wear your seatbelt – Sixty percent of fatal animal crashes occurred when the driver was not wearing a seatbelt. Know the likely deer-crossing zones – Whether or not a road is marked with a Deer Crossing Sign, be especially alert for deer when driving on roads or highways on the outskirts of town and in rural areas – especially where roads divide farm land from wooded land. Use your high beams – When driving at night, especially during peak hazard times, use your high-beam headlights when there is no on-coming traffic. This won’t necessarily deter the deer from entering the roadway, but it will increase visibility so that you can more easily spot the deer sooner. Know when deer are on the move – Be especially careful between 5AM and 8AM and between 5PM and midnight. Don’t rely on devices – Items like deer whistles, deer fences and reflectors have not been proven effective at deterring deer crossing roadways. Brake firmly if you notice a deer near the road – Slow down and stop if necessary. Be careful not to swerve out of your lane either into on-coming traffic or off the shoulder and into a ditch. 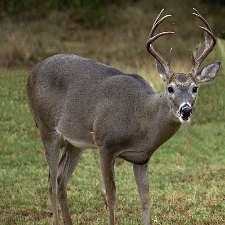 Keep your distance – If you do strike a deer, don’t approach it. An injured deer is frightened and can injure you as well as further injuring itself. If the deer is blocking the roadway, it poses a threat to other drivers; so call the authorities immediately. Rumpke is offering residents of Fort Thomas a FREE recycling cart. ** Please note: These carts are the property of Rumpke, Inc. and are to be used for recycling only. If you already have a toter, you will be charged for another one. These ornaments are being sold at the Museum and the City Building for $20 a piece. Commemorate your wedding or special occasion by purchasing one of these keepsakes! Rake leaves and other debris from your yard and place them in plastic bags or trash bins for disposal. 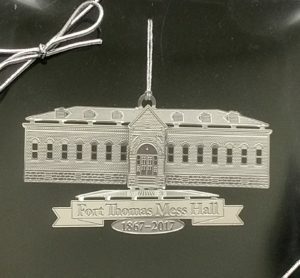 Discover how a military barracks, bare-knuckle boxing ring, the gruesome murder of a pregnant woman, and a local pub contribute to the rich historical heritage of the City of Fort Thomas. The Fort Thomas Military and Community Museum has worked for more than a year with Battery Row Productions to create this walking tour–a tour which is much more than just physically walking. It’s done with smart phones and QR codes or on computers. You will see ten signs throughout Tower Park and the Historic Midway with short explanations of special sites. On each of those signs are also QR codes which will link to further explanations on our website. If you do not have a smart phone, you’ll be able to look up the site and see the entire collection as well as interviews with our local historians, including Gloria Sisk, Linda Rankin, Erik Geiman, Scott Froendhoff, and Betty Daniels. Dozens of historic photos have been included. We hope you’ll spend time learning more about our much loved City! Buy a piece of the walk. A Message from Rumpke, Inc.
Rumpke is asking all customers to wrap mattresses and box springs in plastic before stetting them out to the curb for pickup. Due to the overwhelming outbreak of bedbugs, this will help keep their drivers safe from infestation. Rolls of plastic can be found at most hardware stores and are fairly inexpensive. Customers are asked to contact Rumpke in advance before setting out large items. If the mattress and box spring is not wrapped in plastic or called in for a special pickup, the driver will leave a sticker on it with instructions on action to be taken before the item can be removed. Noon on the Saturday following a council meeting.